Latency in NINJAM is measured in measures, and that’s what makes it interesting. 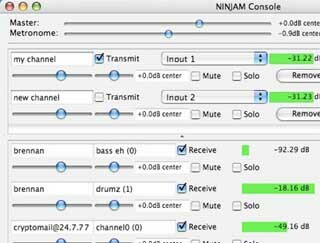 The NINJAM client records and streams synchronized intervals of music between participants. Just as the interval finishes recording, it begins playing on everyone else’s client. So when you play through an interval, you’re playing along with the previous interval of everybody else, and they’re playing along with your previous interval. If this sounds pretty bizarre, it sort of is, until you get used to it, then it becomes pretty natural. In many ways, it can be more forgiving than a normal jam, because mistakes propagate differently. 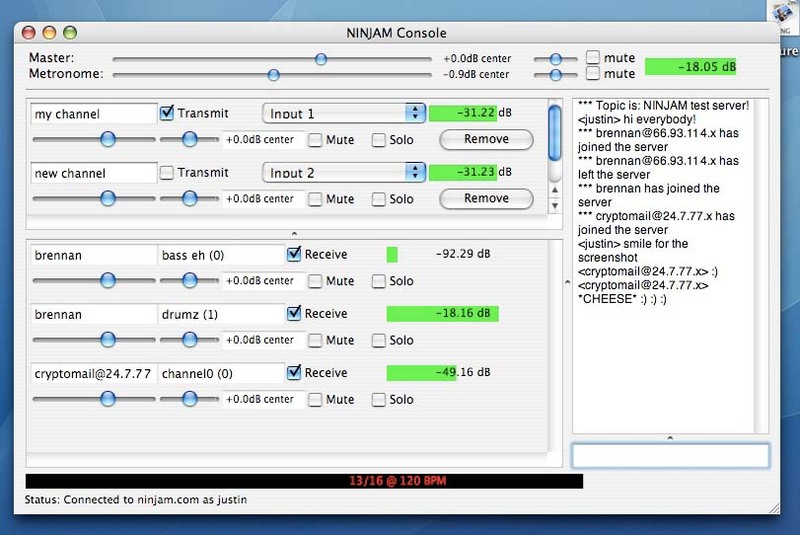 NINJAM uses OGG Vorbis audio compression to compress audio, then streams it to a NINJAM server, which can then stream it to the other people in your jam. This architecture requires a server with adequate bandwidth, but has no firewall or NAT issues. OGG Vorbis is utilized for its great low bitrate characteristics and performance. Each user receives a copy of other users audio streams, allowing for each user to adjust the mix to their liking, as well as remix later. This uses more bandwidth than having a server encode a single stream, but has numerous benefits (including lower server CPU use and the client having the full multichannel data for later use). NINJAM can also save all of the original uncompressed source material, for doing full quality remixes after the jam. 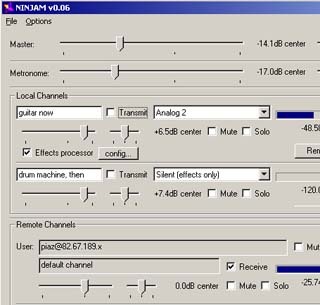 (1): While MIDI has many wonderful uses, it also has substantial limitations when working with real instruments. (2): Limitations of note: sound hardware latency (>5ms), perceptual CODEC latency (>20ms), plus typical and theoretical network latency (>40ms).